Never tires. See - it boils. Death believes in leather leaves. Foes explode. The brave are slowed. Danger waits where water flows. Richard, Orkan, and Melek prepare for the onslaught of the charging beasts, Richard and Orkan's swords drawn. But before the beasts bear down on the trio, they stop and crowd around the heros, whispering to themselves. Then a wilderbeest steps out of the crowd and approaches Richard. 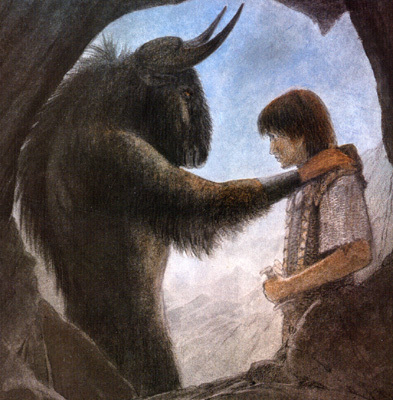 He introduces himself as Broon, the leader of the Common Beasts, and presents Richard with a mail shirt of silver link. Broon explains that the mail is of a metal that can withstand all weapons, and that it is a token of gratitude for Richard saving them from Enlil. The amulet that Enlil wore around his neck was the key to his power, and its destruction freed the Common Beasts from his hypnotic spell. Richard thanks Broon for the gift and informs the leader of his adventures, including that Golan is waiting for all survivors in the Ancestral City, along with Juroot and his bird forces. With this knowledge, Broon and the Common Beasts follow Richard out of the dungeon. Outside, they find the hell hounds have also returned to normal. Orkan cuts through their collars to free them before Broon bids farewell to the trio. As the wildebeest leads his band away, Richard and his friends make their way around the volcano's slopes toward a distant mountain range, eventually walking through several skeleton-like trees. Just then, they hear the sounds of fierce yells and barked orders, sounds they know all too well. They discover that they've stumbled upon a ferocious battle...between Cozards and Grapfrits. They watch as a Grapfrit disappears inside a tight metal box of shields held up by the Cozards, moments later re-emerging while sucking the blood dry from a screaming Cozard soldier. Meanwhile, one Cozard manages to use its sword to slice a Grapfrit in half, sending its sickening intestines spill across the ground. After noticing several dried-out Cozard husks due to the Grapfrits, Richard declares they are mad for even being near the battle and urges to get moving once again. The trio march away from the battlefield, pressing on into the woods. As they do, they notice "bronze-tinted shoots pushed up amid the charred stumps, and giant, leathery plants rose among the dead wood. Richard's throat tightened as he took a second look. Thick, curly tentacles unfurled from the bottom of each plant, and tall-necked, fleshy pitcher-shaped flowers rimmed with saw-like teeth reared up towards the sky. Their delicate amber colouring was veined with dark rust, and from their bases sprouted little tendrils, each ending in a miniature version of the parent growth." Gruesome scenes of combat litter the plants. They see the remains of a lizard between one plant's jaws, while the corpse of a bat dangle's in another. They even see bits and pieces of a Cozard floating in one of the plant's juices. As Richard comments on how the plants look as if they're alive, a furry little animal in spotted fur darts into view, looking around nervously. 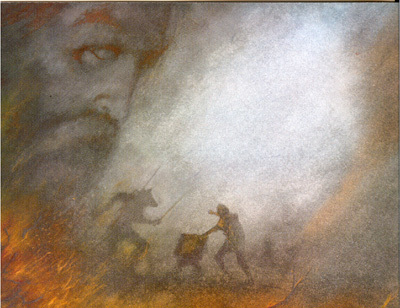 Richard looks at Orkan, who states that the animal isn't in league with the Evil One. As the trio watches, the little animal leaps onto one of the flowers and tips forward to drink from something inside the plant. The plant's sides quiver and the saw-like teeth begin to close. Without warning, Melek rushes forward towards the plant. The dwarf grabs the creature's hind legs and tries to pull, but the plant's grip is too strong. Undeterred, Melek tugs again and leans inside the plant. Richard tries to warn Melek that the plant is a trap, but it's too late: the dwarf is dragged into the plant's mouth, leaving his legs outside to dangle frantically. Richard tells Orkan that they have to get Melek out; the plants seem to live on flesh. Orkan circles the plant looking for a weak spot while Richard grabs Melek's legs to try and pull him out. However, Richard soon starts to feel quite tired and realizes that the plant is giving off some kind of sleep fumes. Richard and Orkan then try to hack the plant open with their blades, but they bounce off the leathery hide. Then Richard suggests burning the creature open. Richard searches for some tinder while Orkan digs a hole near the plant's base. 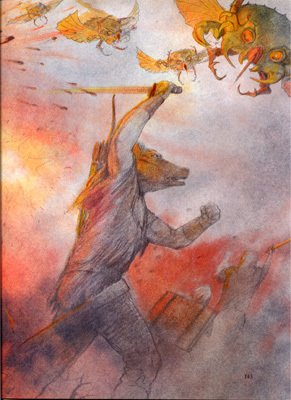 With only Melek's feet visible now, Orkan piles the tinder into the hole and uses a sharp glasslike stone to strike the tip of his sword, creating a shower of sparks. The tinder instantly catches fire, which quickly spread to the base of the plant. Within a few moments, the plant is completely alight, throwing its jaws wide open. Richard quickly takes the opportunity to pull Melek to safety. 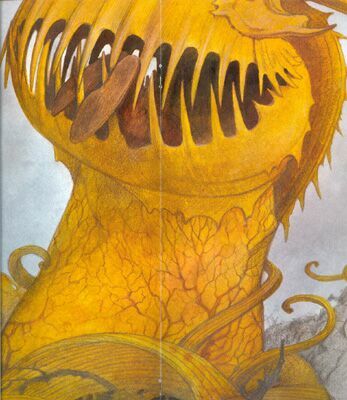 As Melek coughs and splutters, Richard and Orkan notice a familiar gray mass still barely alive inside the burning plant's mouth. 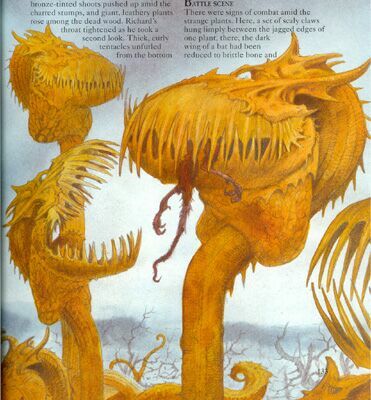 Orkan comments that the creature is nearly dead, but Richard's goodness shine's through and he reaches inside and pulls the creature from the plant's mouth, ignoring the sting of the acidic juices. 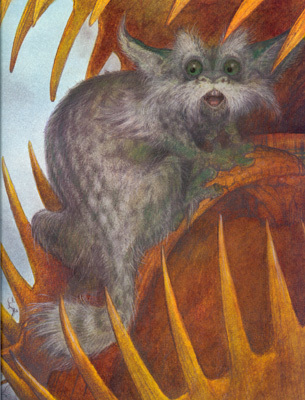 The creature looks up at Richard with frail eyes, then notices the flaming creature and, terrified, bolts from Richard's hands and disappears into the vegetation. The trio notice that the plant is burning brightly with an intense heat and realize that the Cozards might be on their way to investigate the smoke. As the fires begin spreading to other plants in the patch, the trio race away from the scene through the deadly forest of carnivorous plants. Just then, they heard a loud explosion and look behind them to see oily palls of smoke rise into the air, carrying the sickening smell of burning leaves. A second explosion makes them realize that the plants are exploding. As they attempt to run from the exploding fauna, they begin to hear screams of pain. The explosions have caught up with the Cozards, and the fires are burning through their armor and into their flesh. Overhead, a swarm of Grapfrits tries to outrun the explosions as their wings burn. 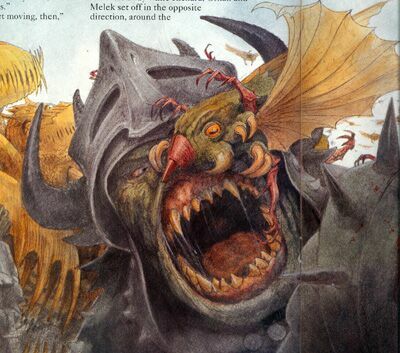 One flaming Grapfrit attempts to attack Orkan, but the pigman slices the creature in two with his sword. Orkan realizes that the Grapfrits know of a way out and orders his friends to follow them. 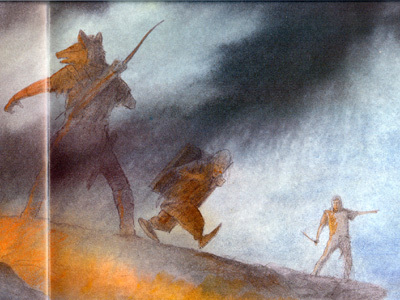 But their guides soon succumb to the fires until they are all killed. Richard and his friends still make their way toward the mountains, but as they leave the forest of plants they find themselves in front of a wide lake. As the fires close in, Richard looks behind him and thinks he sees Golan's face in the smoke, looking at the lake. Without a second thought, he tells his friends to jump into the lake. In terms of the overall story, the ninth volume in The Ancestral Trail is more of a place-holder in that it does little to develop any of the important plot points. However, it does provide further insight into the world that the Ancestral World has degraded into since the arrival of the Evil One. Despite being allies, Cozards and Grapfrits are attacking one another. A once beautiful forest has been overrun by killer plants. One of the few creatures that escaped the Evil One's touch almost became food for one of the carnivorous plants. The Ancestral World truly is a frightening place. Perhaps the most interesting thing that goes on in this episode is that a clue is dropped as to what the second Life Force Pod that Richard found in Enlil's dungeon is. The clue can be found on page 139, where Orkan and Richard noticed the almost dead creature inside the plant's mouth. When Orkan comments on it nearly being dead, Richard's "goodness shone through" and he pulled the creature out to safety. This clue indicates that Richard found the Pod of Goodness. On a final note, the Living Death-Traps have the distinction of being the only (exclusive) front cover creatures that did not receive a card in the card game. While the killer bees from issue six didn't receive a card either, at least they shared a title with Cozards, which did. 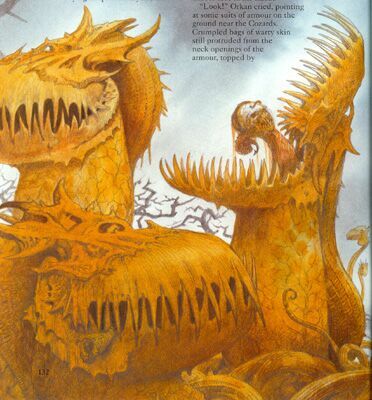 The reason the Living Death-Traps are excluded from the card game is because the creators thought it would be better to use the Grapfrits instead. There are only 52 cards in the deck: 26 for Good, 26 for Evil. 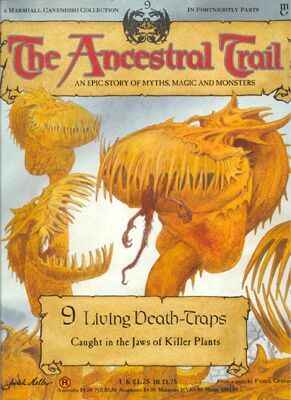 And since there are 26 issues in the series (at least in the series set in the Ancestral World), one Evil creature - the Living Death-Traps - had to be excluded to make way for the Grapfrits. "This mail shirt is for you. It is made of a metal that can withstand all weapons. It is small reward for our freedom. The Evil One's amulet that Enlil wore around his neck was the key to his power. When it was destroyed, the spell we were under was destroyed too." Orkan: "Look! The Grapfrits have sucked out every drop of their blood." Richard: "Then we're mad to even be here. Let's go." "It's too nervous to be in league with the Evil One." "Orkan, quick. We've got to get him out. I think these plants live on flesh. They're just like enormous Venus fly-traps." Melek: "I don't know. I feel very sleepy, and my face hurts." "It's the plants. They're exploding. Run!"